HANDOG Director. 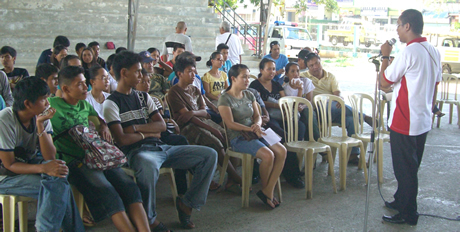 Allain A. Paragas urging the barangay voters to participate and ensure a clean and peaceful election. Its mission was to reach out to the communities and educate the voters. Western Mindanao State University (WMSU) spearheaded a series of voters’ education meetings among different barangay residents in the city from April 20 to 30. This was initiated by the Center for Continuing Education (CCE) led by its director, Dr. Vivian Molina, and Hands of Goodwill (HANDOG) headed by its coordinator, Allain A. Paragas, in collaboration with the Commission on Election (COMELEC)- Region IX. Paragas said the series of fora was primarily aimed at urging the voters to exercise their right of suffrage and to participate in the May 10 general elections to ensure it would be clean and peaceful. Along with this aim, Paragas added, the fora also served to inform the public about the importance and impact of elections in the country; addressing issues and concerns related to elections; and how to use the Precinct Count Optical Scan (PCOS) machine and how it works. WMSU held the voters’ education in the following barangays: San Roque, Labuan, La Paz, Maasin, Sinubong, Talisayan, Patalon, Ayala, Sinunuc, Recodo, Cawit, Tulungatung, Sta. Maria, Limpapa and Pamucutan. In a related event, the WMSU University Center for Local Governance (UCLG) and the CCE also spearheaded a voters’ education forum among University Directors, Deans and Associate Deans last April 29 at the College of Public Administration and Development Studies (CPADS) library. Mrs. Celyn Aron-Verallo, Social Awareness and Community Service Involvement Office (SACSI) Director at the Ateneo de Zamboanga University, discussed issues related to the plight of the Filipino people and the current situation of the country, thus underscoring the importance and impact of the 2010 elections. Mr. Ador Morados of the COMELEC-Regional Office stressed on the crucial issue of automated election and showed how easy, simple and effective the use of Precinct Count Optical Scan (PCOS) machine is. On the other hand, Mr. Darren Torres, Coordinator of Parish Pastoral Council for Responsible Voting (PPCRV), shared updates on the current electoral scenario in the country as how his organization is working for a clean and peaceful election. Earlier on, CCE and HANDOG spearheaded a series of voters’ education trainings among student voters within the university last March. CCE and HANDOG, however, sensed the need to go beyond the portals of the university by involving barangays in the significant undertaking.